Asiana Airlines is a hugely popular choice for travelers with points and miles mainly because of its hospitable crews, authentic Korean food, and the offering of solid hard products. Asiana Airlines is also extremely reliable when it comes to releasing award availability. That is, there’s typically at least 4 business class seats and 2 first class seats available for points redemption at all times. Additionally, they’re one of only a few airlines that operate non-stop flights to South Korea, a very hot tourist destination. Asiana Airlines operates quite a few aircraft, considering its relatively small route network. In this guide, we’ll explore the nuances of Asiana Airlines routes, aircraft, and seats. Overall, Asiana Airlines keeps its aircraft routing pretty consistent. Until recently, Asiana flew the A380 Superjumbo to New York City (JFK) and Los Angeles (LAX), but the New York City (JFK) service has since been changed to the A350. Let’s quickly touch base on what type of points you need to earn to fly Asiana Airlines. Asiana Airlines is a Star Alliance partner airline. 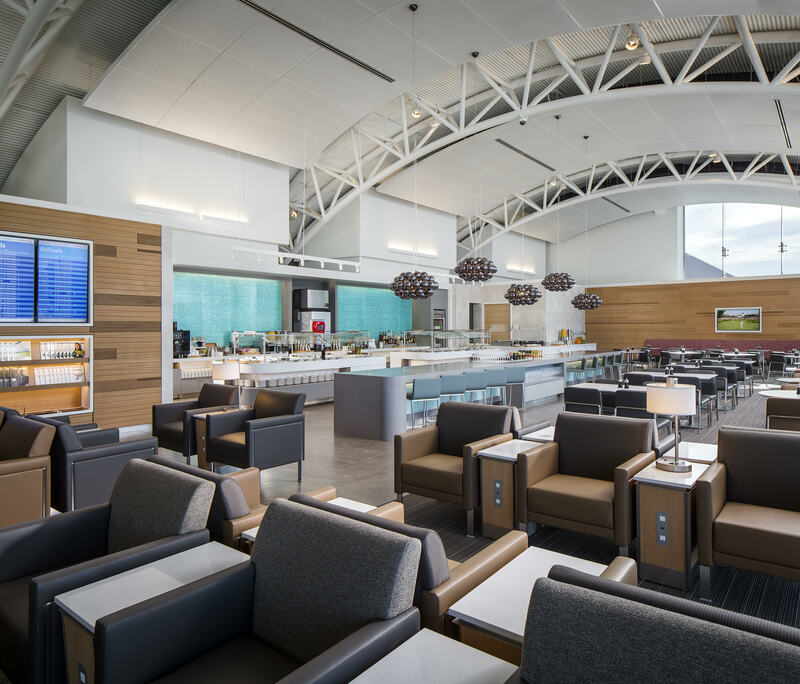 As a result, travelers are eligible to redeem United MileagePlus miles and Air Canada Aeroplan miles. One of the best ways to fly Asiana Airlines is by using ANA Mileage Club miles. ANA has a fabulous frequent flier program with tons of value. Also, ANA is transfer partners with American Express Membership Rewards and Marriott Rewards, so there are tons of ways to earn ANA miles. You may also use Asiana Club miles. Their miles are slightly harder to earn, as their only transfer partner is Marriott Rewards. 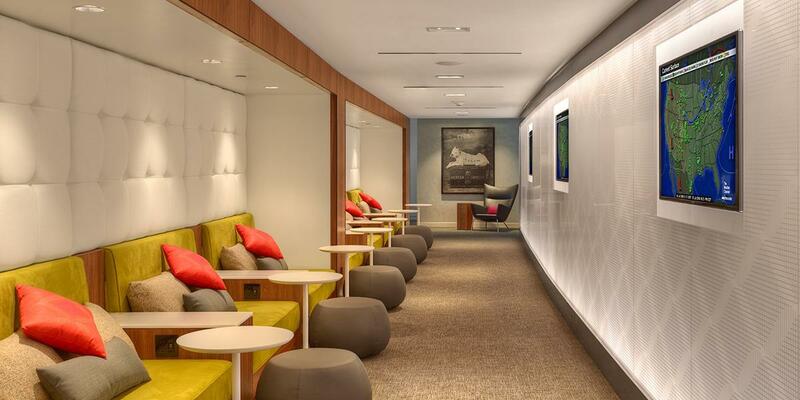 Still, there are a lot of ways to earn Asiana Club miles, so don’t overlook this option. If neither of those options fit with your habits, you can also use United miles and Aeroplan miles. Asiana Airlines’ First Class Suites are spacious and private. Image courtesy of pointswise.ca. The A380, also known as the Superjumbo, is a monstrous aircraft of unbelievable size. Asiana Airlines operates first class on all A380s. Unfortunately, there are a lot fewer A380s used by Asiana today than in previous years. Past airports include San Francisco (SFO) and New York City (JFK). Today, Los Angeles (LAX) is the sole city through which Asiana Airlines operates the A380. Asiana Airlines’ first class is representative of understated luxury. The cabin finishes can look plain, but the immense seat size, excellent catering, and sliding doors make for a private, delicious, and spacious ride to South Korea. Let’s talk about the seat configuration in the A380. The A380 contains 12 First Class Suites in 3 rows with a 1-2-1 configuration. Asiana Airlines A380 first class seat map. Image courtesy of seatguru.com. The first class cabin is located at the front of the lower deck, unlike many A380 first class products. The First Class Suites are luxurious and spacious. Each of these A380 first class suites is 25.2 inches wide, 84 inches in pitch, and 81 inches long in bed mode. These First Class Suites truly are made for the world’s biggest people, with an astonishing 84-inch pitch. As you can see in the image above, the lavatories are located on the right side of the aircraft. 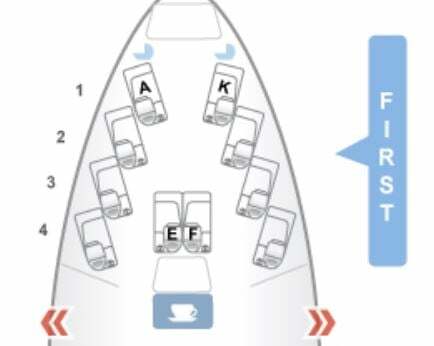 As a result, the seats to avoid would be 1F and 1K. I would personally choose 3A as the best First Class Suite on the Asiana Airlines A380, as you wouldn’t encounter any foot traffic around your seat. Couples traveling together should select 3E and 3F for the same reason. With a relatively large cabin of 12 First Class Suites, you’ll be very pleased to find out that award availability is not only plentiful but also consistent. Let’s examine our second and last first class option with Asiana Airlines, which is aboard the 747. The 747, known as the Queen of the Skies, is a passenger aircraft with an upper deck at the nose. The 747 first class cabin on Asiana Airlines is located on the upper deck, in the nose. This is a very private configuration, but because of the drastic difference in seat size, the 747 is the runner-up to the A380. The 747 First Class Suites are significantly smaller at 21 inches wide and 78 inches in pitch and bed mode. Asiana Airlines 747 first class seat map. Image courtesy of seatguru.com. There are a total of 10 seats at the nose of the aircraft, 8 of which are window seats. Solo travelers will love seats 1A and 1K for the absolute privacy they provide. 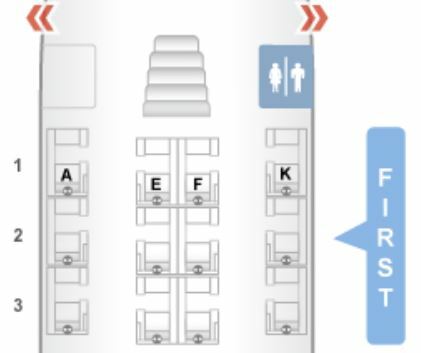 If you’re traveling with a partner, the only option you’ll have to sit next to one another is 4E and 4F. Still, these seats are very private and enclosed, so you’ll have your own space together. Bottom Line: Asiana Airlines offers first class to/from the United States on the A380 and 747. The fully-enclosed suites on the A380 are significantly larger than those on the 747, which is why it takes the first place prize with Asiana Airlines. 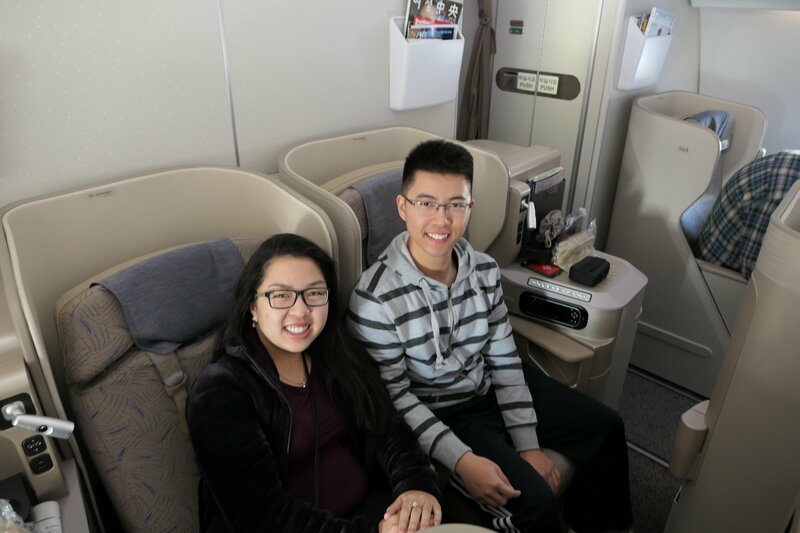 Enjoy Asiana Airlines Business Class like I did with my fiancee! Image courtesy of Stephen Au. 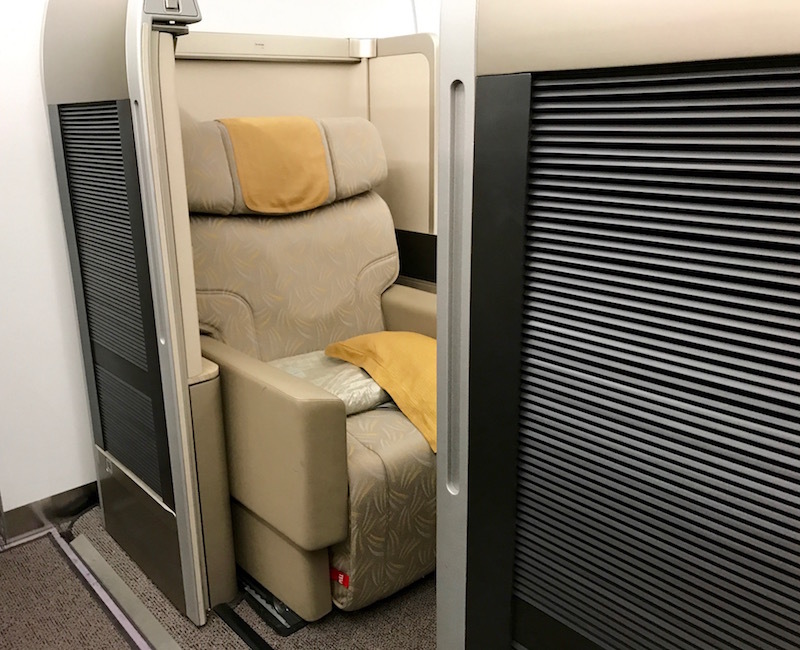 Now that we’ve gotten the ever-so-popular Asiana Airlines First Class Suites over with, let’s discuss their different business class products. As we mentioned above, Asiana Airlines operates 5 aircraft on its long-haul routes to the United States, all of which have a business class cabin. As we’ll find out, there are clear winners for best business class across the Asiana Airlines fleet. Asiana Airlines offers its flagship business class product, known as Business Smartium, on the A350, A380, and 777-200. 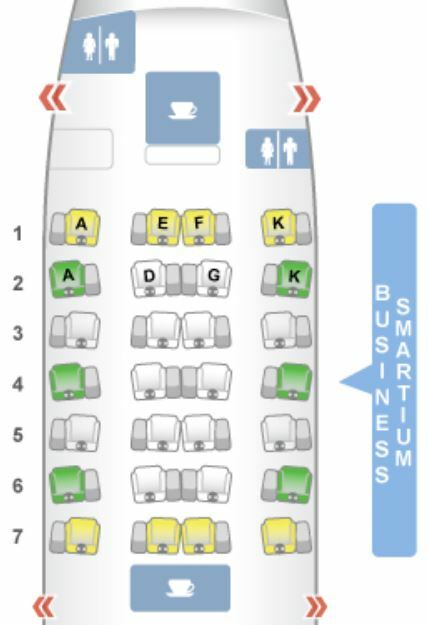 Of course, these Business Smartium seats are fully lie-flat and feature direct aisle access. As you can probably predict, the planes that haven’t been mentioned yet are angled-flat seats with not-so-direct aisle access. The A350 is our winner in business class for a few reasons. First, the intimate business class cabin consists of only 28 Business Smartium seats arranged in a 1-2-1 configuration across 7 rows. Each of these seats is 22 inches wide and 77 inches in pitch and bed length. Asiana Airlines A350 business class seat map. Image courtesy of seatguru.com. 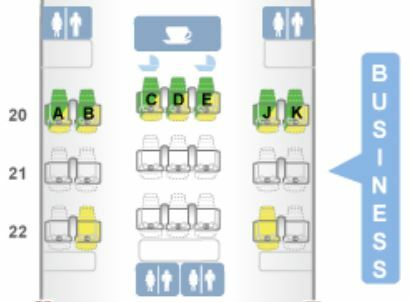 The odd-numbered rows have aisle seats on the side while the even-numbered rows have window seats on the side. As a general rule of thumb, you want to be as far from the walkway as possible, so the best seats are even-numbered row seats. We would recommend 6A and 6K because it’s located at the back of the cabin but not right in front of the galley. Couples traveling together may like the honeymoon seats in even-numbered rows. Just avoid the seats in the front, as they’re closest to the lavatories. Let’s move onto the A380, which has the same Business Smartium design. Although these seats have the same design, the A380’s seats are slightly smaller at 21.3 inches wide, 80.4 inches in pitch, and 74.5 inches long in bed mode. Since the A380 is such a large aircraft, it makes sense that there are more business class seats than on the A350. There are a total of 66 business class seats, which split into 2 mini-cabins. Asiana Airlines A380 business class seat map. Image courtesy of seatguru.com. The best seats in this cabin are unclear. 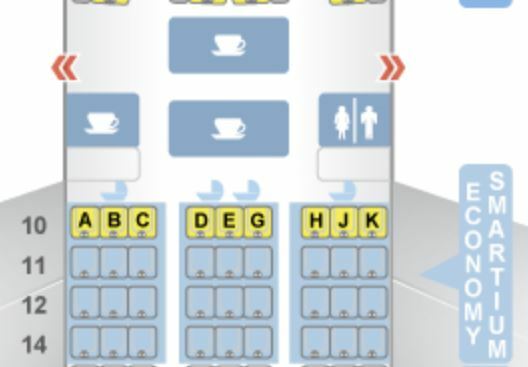 You’d want to avoid seats in row 24, 11, and 7 due to their proximity to the galley and lavatories. As a traveler, I’d probably lean towards rows 8, 10, or 15. The next business class product and last Business Smartium product is aboard the 777-200. These seats are the smallest of the Smartium Business seats, but still a viable option for those who want lie-flat seats with direct aisle access. The 777-200 Business Smartium seats are 20.2 inches wide, 80.4 inches in pitch, and 74.5 inches in bed length. 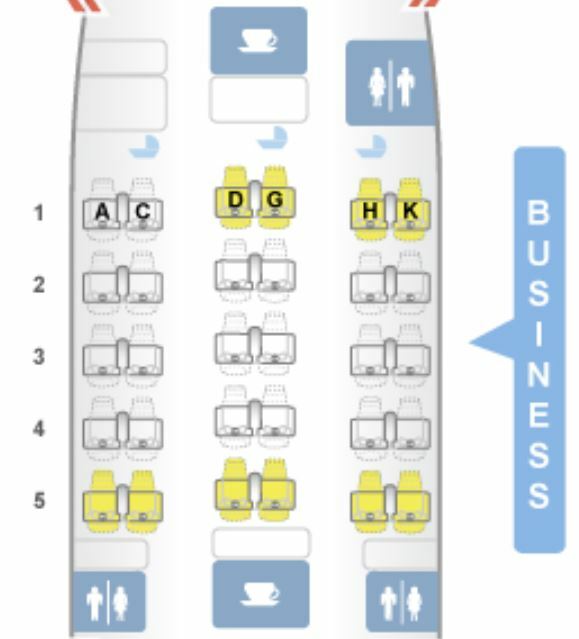 Basically, the 777-200 seats are the same length but are narrower than the A380 Business Smartium seats. 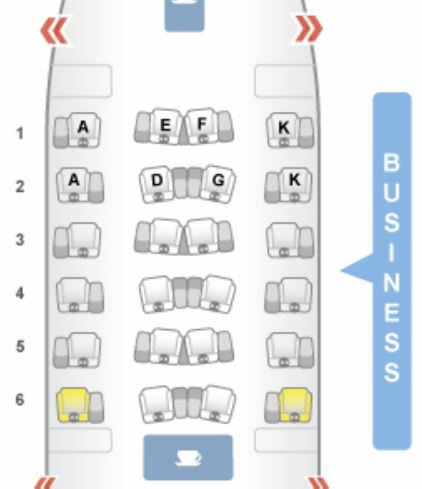 Asiana Airlines 777-200 business class seat map. Image courtesy of seatguru.com. The lavatories are located at the front of the aircraft, so the most private seats will be located at the back of the business class cabin. Window seats in row 6 are private but have a misaligned window. If you don’t mind that, then those will be the best seats. Runner-up seats include the window seats in row 4. Now that we’ve exhausted all of our Business Smartium options, we’ll want to talk about the other, inferior options that Asiana Airlines has available. First up is the A330 which is flown in a 2-2-2 configuration. These seats are 26.5 inches wide and 58 inches in pitch, making these seats even wider than the First Class Suites. Still, an angle-flat seat is not the most comfortable for long-haul flights. In this case, these seats have a maximum of 168 degrees of total recline. Asiana Airlines A330 business class seat map. Image courtesy of seatguru.com. It’s difficult to predict which seats are the best, but if you utilize some game theory, you might be able to lean towards 3H and 3K. If you assume that travelers will travel to the lavatory closest to them, then 3H and 3K, in theory, will be the most private. It might be best to just avoid row 1 and 5 seats altogether. The last and worst business class product is, shockingly, on the 747. There are two separate mini-cabins of business class with each seat measuring 20.2 inches wide and 59-60 inches in pitch. All 45 seats are angle-flat. 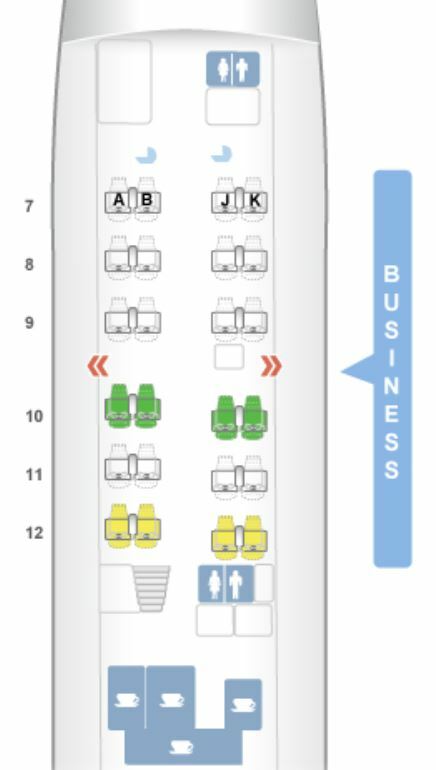 There are two seating configurations on the 747 in business class: 2-2 and 2-3-2. The 2-3-2 configuration is ultimately what brought the 747’s rank down to dead last. Asiana Airlines 747 business class seat map 1. Image courtesy of seatguru.com. Asiana Airlines 747 business class seat map 2. Image courtesy of seatguru.com. If you manage to find yourself on the 747 flying Asiana Airlines business class, try your best to choose seats in row 10, which are the most spacious and have a reasonable amount of privacy. That does it for our Asiana Airlines business class options. To recap, the best business class seats are on the A350, which are the widest and feature the best-in-class Business Smartium seats. Let’s move to the Asiana Airlines Premium Economy options. Asiana A350 Economy Smartium. Image courtesy of business traveller.com. The only Asiana Airlines aircraft that utilizes premium economy (called Economy Smartium by Asiana) is the A350. The A350’s premium economy cabin is nothing to write home about. The entire cabin consists of 36 seats in a lackluster 3-3-3 arrangement. These seats are 18 inches wide and 36 inches in pitch, which makes them only slightly larger than some airlines’ economy seats. Asiana Airlines A350 premium economy seat map. Image courtesy of seatguru.com. The lavatory and galley are located at the front of the premium economy cabin, so the best seats are likely to be in row 14 due to the increased privacy you’ll receive. Asiana Airlines A380 economy. Image courtesy of flight-report.com. We’re going to wrap up our Asiana Airlines routes guide by discussing the various economy options you have. The A380 tops off our ranking list because it has several preferential seats, the biggest seat size, and the best overall in-flight experience. Let’s do some analysis to understand why we love economy class in the A380. Each of the seats measures an astonishing 18.9 inches in width and 33 inches in pitch. These 417 seats are some of the biggest economy seats in the business! The configuration is relatively mixed, with one configuration being 3-4-3 and the other configuration being 2-4-2. Asiana Airlines A380 economy class seat map 1. Image courtesy of seatguru.com. The best seats in the 3-4-3 level are 55A, 55K, 48D, and seats in row 30. You’ll have much more legroom to stretch out in these seats. You would necessarily want to avoid seats close to lavatories due to the noise and odor. Asiana Airlines A380 economy class seat map 2. Image courtesy of seatguru.com. If you can, you’ll want to snag some couples seats in this cabin. The best seats will be in row 80 due to the exit row. Now that we’ve spent some time talking about the first place winner let’s move on to our runner-up, the 777-200. The 777-200 is our runner-up primarily because of its seat size. The seats are each almost an inch narrower than those on the A380. Specifically, the seat measures up at 18 inches wide and 33-34 inches in pitch. There are a total of 271 seats configured (mostly) in a 3-3-3 arrangement. There are a couple of ideal seats you can choose, but you’ll want to act fast because there aren’t that many. Asiana Airlines 777-200 economy class seat map. Image courtesy of seatguru.com. 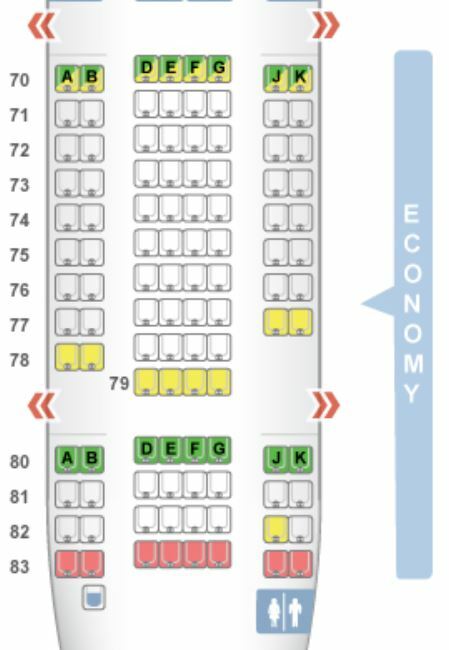 The best seats to nab on the 777-200 are 11C, 30B/C, and 30H/J. 11C is missing a seat in front of it, so you can have tons of room to stretch your legs out. Row 30 seats are exit row seats, which will afford you more legroom. The downside of row 30 seats is that you’ll be very close to the lavatories. Couples sitting together may also want to take seats 10A and 10B, which are bulkhead/bassinet seats. Our middle-ground, third place winner is the economy cabin on the A350. Compared to the 777-200’s seats, the A350 is slightly shorter. Instead of having 33-34 inches in pitch, you’ll get 32-33 inches. The width is the same at 18 inches. Asiana Airlines A350 economy seat map. Image courtesy of seatguru.com. 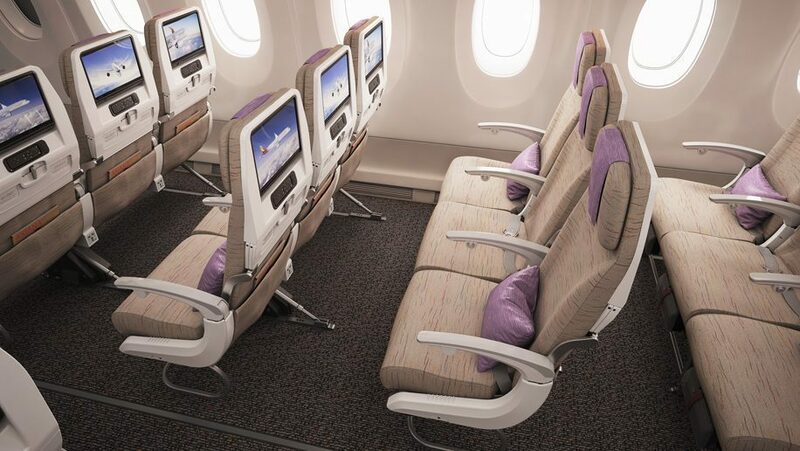 Seats 29B/C, 29H/J, 30A, and 30K are the best seats you’ll be able to get in Asiana’s A350 economy cabin. You’ll have a lot of legroom to stretch out in. The next seating option is on the A330, which is the smallest long-haul aircraft that Asiana Airlines operates on routes to/from the United States. The economy seats are even more narrow, at 17.7 inches wide and 33 inches in pitch. Asiana Airlines A330 economy class seat map. Image courtesy of seatguru.com. The best seats are in rows 10 and 30, due to the extra legroom from the exit row. Unfortunately, you’ll hear a lot more noise due to the lavatories and the galleys being so close to the seats themselves. The 747 is a huge aircraft; not gargantuan like the A380, but still capable of carrying tons of passengers. You’d think the seats would be large and spacious, just like the economy seats on the A380, but this is definitely not the case for our last-place Asiana Airlines economy option. In fact, seats will be significantly narrower at 17.1 inches wide and 33-34 inches in pitch. The silver lining of the 747 compared to the A380 is that the seats may be slightly longer. Asiana Airlines 747 economy class seat map. Image courtesy of seatguru.com. The 747 cabin, for the most part, is arranged in a 3-4-3 configuration in economy. 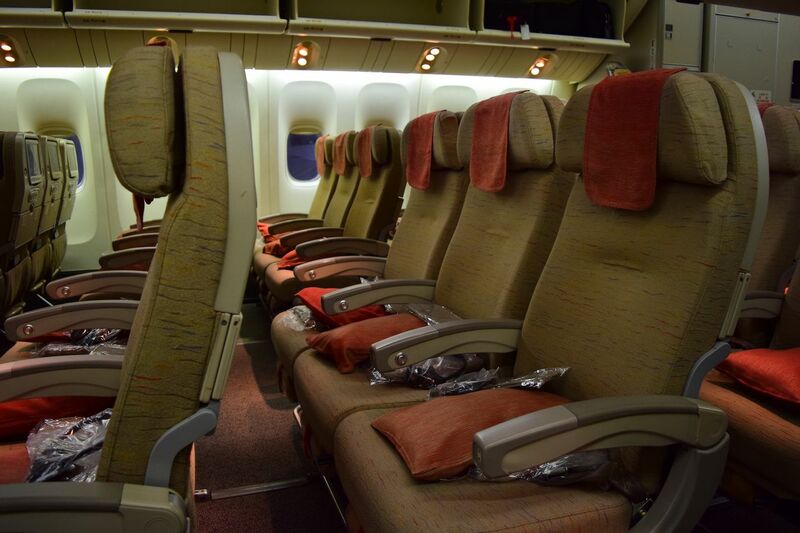 However, there are several preferential seats you can take advantage of to make your in-flight experience better. We’d suggest selecting 38B/C or 38H/J. These seats have lots of extra legroom and are closer to the front of the aircraft so that you can board/deplane quicker. Some other options include 30C, row 48, and 27A/B. If you notice all of the extra legroom seats are taken, consider sitting somewhere with only 2 seats on each side, like rows 28 or 29. On the whole, there are quite a few ways to fly on Asiana Airlines. As you have found out above, all of the seat types have variation, whether the seats are in first class or economy class. To this day, Asiana Airlines is one of the best ways to fly to South Korea, but it’s very important to understand the products on the different aircraft. Hopefully, this guide has given you additional information to help optimize and plan your trips. What's the best way to book Asiana Airlines First Class Suites? The best way to book Asiana Airlines First Class Suites is quite subjective. You may use 80,000 Asiana miles during off-peak season to book a one-way flight. Unfortunately, their only transfer partner is Marriott Rewards. Other options include Avianca LifeMiles, which charges 90,000 LifeMiles, United MileagePlus, which charges 110,000 United miles, and Air Canada Aeroplan, which charges 105,000 miles each way. ANA charges 180,000 miles but only round-trips are allowed. What's the best ways to book Asiana Airlines business class? ANA only charges 95,000 miles for round-trip business class, which is a steal! ANA is transfer partners with American Express Membership Rewards and Marriott Rewards. You may also use 120,000 Asiana miles for round-trip business class or 60,000 Asiana miles one-way. Remember that Asiana Airlines is only transfer partners with Marriott Rewards. Other one-way options include 75,000 Aeroplan miles, 75,000 Avianca LifeMiles, and 135,000 Lufthansa Miles & More miles. What are the best ways to book Asiana Airlines premium economy class? Pretty much your only option to book premium economy with points is to use Air Canada Aeroplan miles. The total cost will be 125,000 Aeroplan miles round-trip or 62,500 miles one-way. We don’t recommend using this method because for only 25,000 miles round-trip or 12,500 miles one-way more, you can fly in business class. 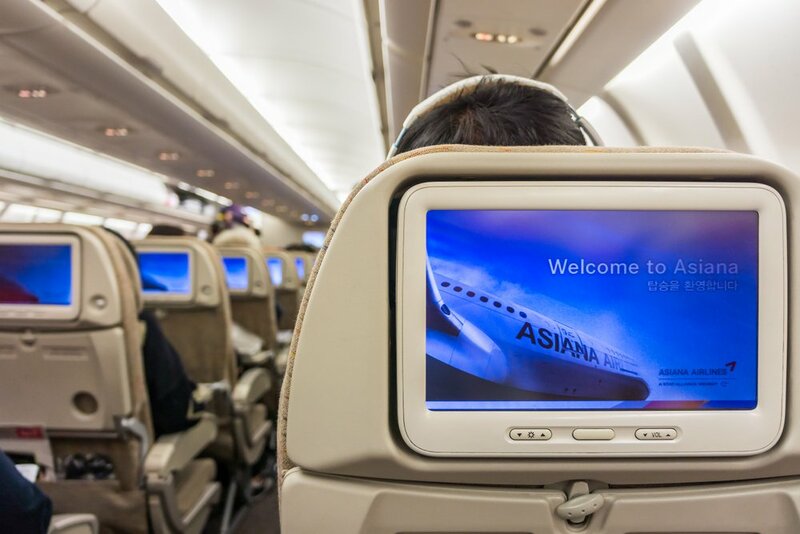 What's the best ways to book Asiana Airlines economy class? The clear winner when it comes to Asiana Airlines economy is ANA. You’ll only pay 60,000 ANA miles for round-trip economy tickets. ANA is transfer partners with American Express Membership Rewards and Marriott Rewards too, so you’ll have plenty of ways to earn a lot of miles. Another round-trip option is 70,000 Avianca LifeMiles, which is transfer partners with Citi ThankYou Rewards, American Express Membership Rewards, and Marriott Rewards. If you have Chase Ultimate Rewards points, you’ll be happy to find that United only charges 70,000 miles for round-trip economy tickets on Asiana Airlines. OZ 221 | Airbus A380-800 is still available to book from JFK to ICN in First class for August/September 2019. Thanks for reading. Unfortunately, OZ 221 is currently offering the A350-900 on the service from JFK to ICN. We will update this when the time draws closer as operational changes happen quite often.